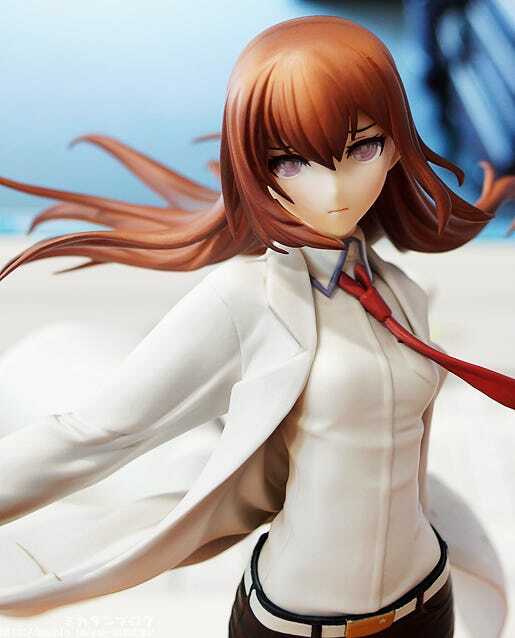 Kahotan's Blog | GOOD SMILE COMPANY Figure Reviews | 1/8th Scale Kurisu Makise: White Coat Ver. Only 12 days left until WonFes!! Wonder Festival 2013 (Summer) is just around the corner!! The offices are filled with display simulations and everyone is busy getting ready for the big day! One of the many things to look forward to is this year’s WonFes products! 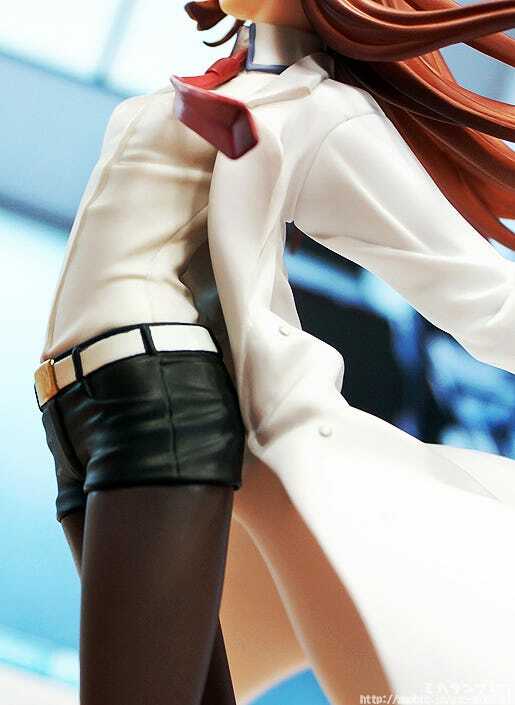 Kurisu Makise: White Coat Ver.! 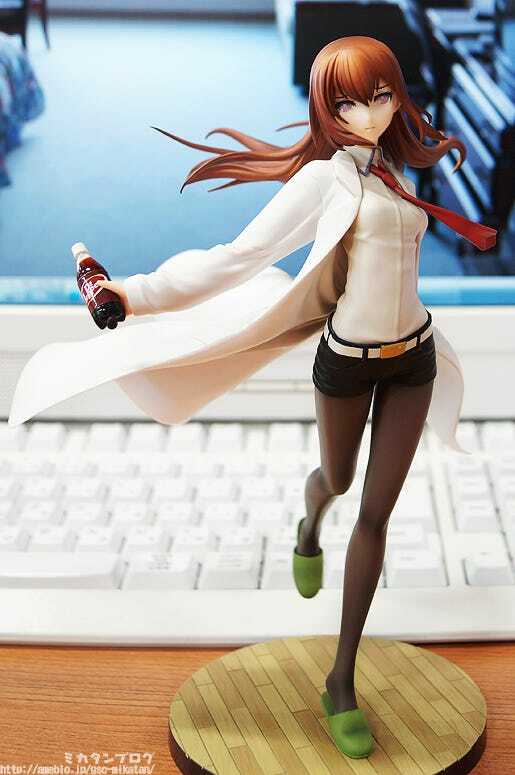 The ‘hypothetical science adventure’ game Steins;Gate has just recently had a sequel and movie version released, and from that series comes a 1/8th scale figure of Kurisu Makise wearing her white lab coat. She is posed with her long white lab coat fluttering behind her, as she blushes with the same cute expression she made whenever others made fun of her. In her right hand she holds a bottle of ‘Dr.Iepper’ and on her left wrist she is wearing Mirai Gadget #12: ‘Darling no Baka’. It’s a pose and figure that any fans of the tsundere genius are sure to enjoy! 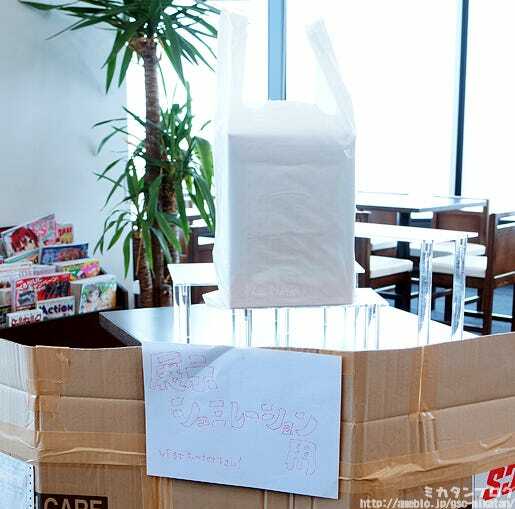 The first WonHobby product review is none other than Christina!! This is a special version of the 1/8th scale Christina released in March 2012, which features her wearing her lab coat instead of her casual clothes! The pose is the same as the previous version, but the overall sculpting has been changed quite a bit when compared to the original! Those who already own the original version can display the two together, while those who missed out on her can take this opportunity to add the lovely Christina to their collections!! On her left wrist you can see the Future Gadget #12: Darling no Baka, and in her right hand she is holding a bottle of Okarin and Christina’s favorite drink! 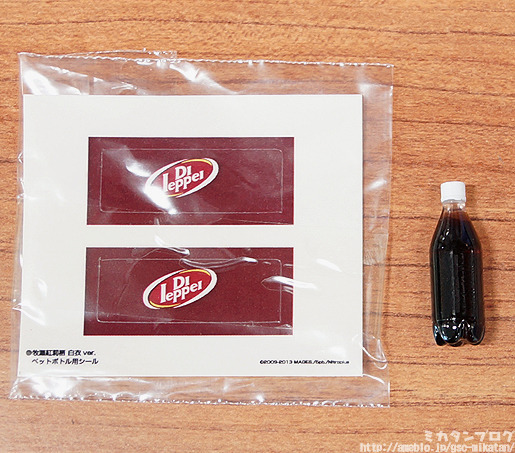 This is the bottle and stickers included! The label needs to be stuck on manually, but it’s just a matter of wrapping it around the middle so it’s not a difficult task at all! Another thing I have to point out is the paintwork of the liquid in the bottle! Christina is holding the bottle at an angle, so the liquid inside the bottle is also slightly over to one side! Try and stick the label on so that the logo is on the side with less liquid, as this will leave the label showing when she is holding it at the right angle! I wouldn’t call this flat-chested at all!! Not to mention that her low-rise hotpants and the creases on her blouse all look fantastic too!! The blushing Christina looks so cute! She may normally be a very strong-willed character, but the times when these adorable expressions come out are when I really fall for her! It’s also rather amazing how nicely huke’s original illustration has been preserved in the figure! 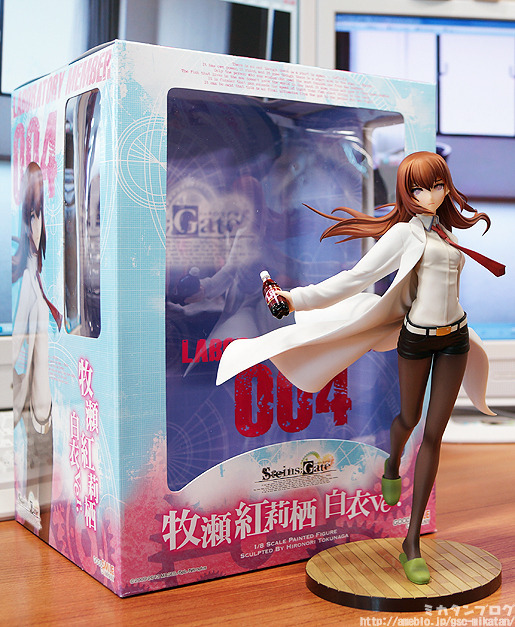 It makes it a must-have figure not only for Steins;Gate fans, but also fans of huke as well! The lab coat is a little too big for her! 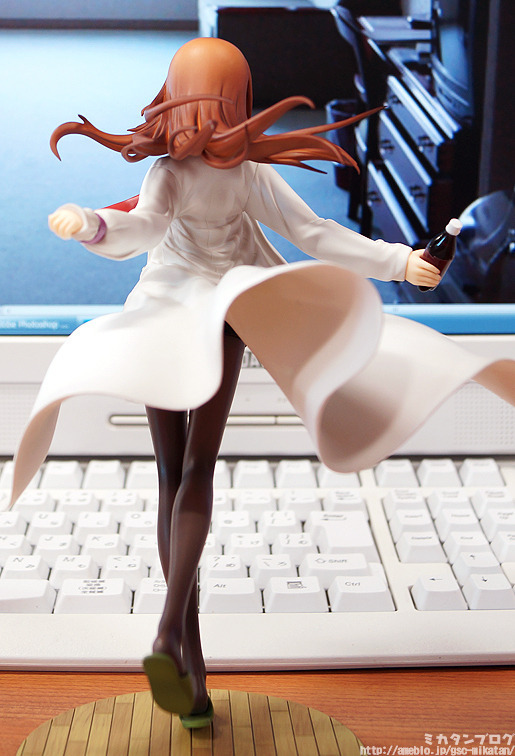 Looking at her from the back and seeing the lab coat billowing behind her along with her hair flowing behind her really gives a lovely dynamic feeling to the figure! In most cases I don’t think a lab coat would ever be considered a fancy item of clothing, but the careful work of the sculptors and painters has turned this one into a feast for the eyes! Just look at those folds and shadows!! Green slippers for the lab! Inside the lab means a lab coat and green slippers! Yet another item that is very memorable in the series! The slightly raised up heel and the smooth stockings all come together to create some rather captivating legs! The areas below her thighs and behind her knees make use of a slightly darker gradient to create a stocking-like appearance, which also looks fantastic! There are two ways to get hold of her! (ﾟ∀ﾟ) She’ll be on sale at the WONDERFUL HOBBY LIFE FOR YOU!! booth at Wonder Festival (Summer) in the Makuhari Messe on 28th July! 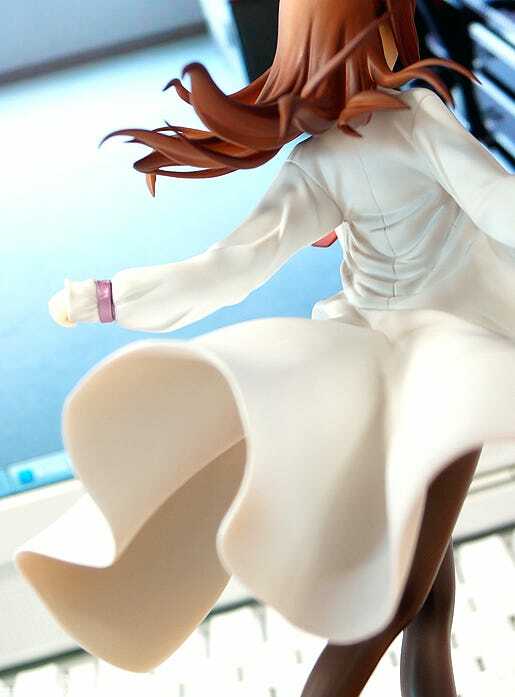 (ﾟ∀ﾟ) From the 28th July she’ll be available from the GOOD SMILE ONLINE SHOP!